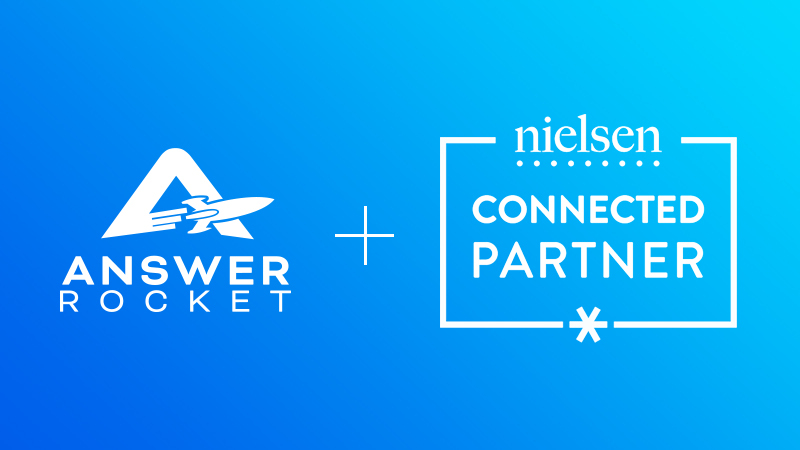 I’m thrilled that AnswerRocket has joined Nielsen’s Connect Partner Network. Nielsen is the industry leader in fast-moving consumer goods and market data. If you want to know what shoppers are doing, Nielsen offers the best source of information. AnswerRocket, similarly, is the industry leader in AI-powered data analysis. If you want to automate the process of getting deeper insights into your data, AnswerRocket can do just that. The Connect Partner Network builds connections between Nielsen and companies servicing the CPG and retail industries. If you want open collaboration between Nielsen’s expansive data and top-of-the-line analytics tools, the Connect Partner Network can facilitate those conversations. That’s why this partnership is great; everyone involved is bringing incredible resources, insights, and aspirations to the table. Our partnership is especially timely, given the current landscape for leading consumer goods manufacturers. To stay competitive, CPGs need to identify growth opportunities and keep a handle on consumers, brands, competitors, and the market. Here’s how AnswerRocket’s collaboration with Nielsen can empower CPGs to do just that. AnswerRocket customers now have streamlined access to Nielsen data, which means better, more comprehensive market analysis within seconds. Plus, with Nielsen’s industry expertise and AnswerRocket’s AI-powered insights, it’s faster and easier than ever before to see what this data actually means and go beyond surface-level analysis. Don’t just know that sales are down in the Southeast. Know how your sales compare to the general health of the region’s market. Then drill in to determine which brands, SKUs, stores, and more are contributing to this dip. Let our machine learning insights pinpoint exactly where your opportunities lie. Are you following marketplace trends? Are there any notable deviations? With Nielsen’s data, you can put your analytics into the right context and see how you stack up against the market. How did Brand X perform last month? What is the market penetration for Brand X by month? Key players can make decisions faster and with more information than ever before. So the Connect Partner Network is great for business, and ultimately, the bottom line. But let’s broaden the context. What does the Connect Partner Network mean for the future of analytics? Keep valuable data out of reach for the businesses that need it. Slow down data analysis with an inefficient, labor-intensive process. In other words, the Nielsen Connect Partner Network is creating a system where data flows seamlessly between Nielsen clients and partners — all for the benefit of the end user. Bridging the gaps between information and insights empowers business people to enjoy a streamlined pathway from questions to results. Employees such as your marketing team members, who really need to know the nitty-gritty details of your sales figures on a constant, rolling basis can get those figures whenever they need them. Putting powerful data in the hands of the people who can use it most is important to us. By removing barriers to insights, the Connect Partner Network shares our goal. We’re committed to providing even more value with better data and incredible insights that can shape the future of your business. Ready to see AnswerRocket in action? Learn how AnswerRocket leverages data like Nielsen’s to produce powerful insights into your business and industry. Get started with a demo today.